Are you ready to change your concept of drugs? AMSYSTEMS combines years of experience in industrial additive manufacturing and mechatronics and will make — together with the involved industrial partners — the step towards the next generation of industrial Additive Manufacturing production systems. Collaborate with us and create the future of industrial additive manufacturing. Working on a wide range of application fields with experts on 3D Food printing, 3D Pharma and 3D Structural Electronics. AMSYSTEMS is developing high speed additive manufacturing systems capable of fabricating multiple products at once. These systems will enable industry to embark on the next generation of manufacturing. Posted on 6 November 2018 at 11:50. On 25th October 2018 the European Commission has visited Eindhoven University of Technology, including AMSYSTEMS Center. As AMSYSTEMS Center is partner in the Smart Industry Fieldlab Multi-Material 3D and the Fieldlab is subsidized by OPZuid we showed what we have achieved so far within Fieldllab Multi-M3D. Next to the demo of the Lepus NextGen printer, we also showcased the full-colour dental elements and printed electronics. The European Commission reacted very positive on our presentation and has received a good impression of the importance of subsidies (from OPZuid). More about Fieldlab Multi-Material 3D. Posted on 16 October 2018 at 11:24. Anton Aulbers is Senior Project Manager for Additive Manufacturing Equipment at the AMSYSTEMS Center that nestles at the fringe of the Eindhoven University of Technology campus where he is in the process of handing over the lead of the MultiM-3D Fieldlab to his colleague, Frits Feenstra. Both were in from the start, with Aulbers co-writing the proposal to establish the Multi-M3D as an umbrella for people to meet and connect and to facilitate a number of technology projects. Funding is, of course, key to the continuity and continuation of the Multi-M3D fieldlab, and the competition for funding is intense. The main sources of funding for the Multi-M3D fieldlab are OPZuid, the European Regional fund for the South of the Netherlands and the Province of Noord Brabant. Other sources include European framework projects and the occasional project co-funding from industrial partners, although this is often expressed in kind rather in cash. “Having started in the Brabant area with its very strong high-tech sector, we are looking at how we can take this largely regional ecosystem we have developed into a more national arena and beyond to other countries where our contact base is growing. Interest in what we are doing is increasing. A very tangible result of where the Multi-M3D fieldlab did help to catalyze the transformation of a concept to product can be seen in the development of a denture whose appearance is ‘natural’. Océ-Technologies is working with TNO and NextDent to 3D print artificial colored teeth for dentures and crowns that will not only provide better-looking results but also significantly reduce the labor-intensive process involved in making dental prostheses. Feenstra explains. “To print natural-looking dentures, every voxel – that’s the 3D equivalent of a pixel – must be different in terms of color and transparency. It will soon be possible to print a complete tooth in less than 30 minutes and this is just the beginning. In the future, the biomedical applications of the technology could extend to printing skin or prostheses.” So far, the focus has been on developing the materials, hardware and software, but the first 3D dental objects are expected to be market ready by mid-2019. Posted on 11 October 2018 at 10:23. Posted on 10 September 2018 at 12:32. Posted on 10 September 2018 at 10:44. Are you from SMEs and your focus is innovations in the field of AM? Then the AMable call is interesting for you. The AMable call, funded by European Union Horizon 2020, aims to enable SMEs to take up AM with the help of financial support and AMable Services. These services target at support and upskilling of employees in the areas of design for AM, technology development, skills and education and to support their business development. The funding rate is 70% of eligible cost. The first round closes at 1st of October 2018. Feasibility Studies (5k – 20k): short-term experiments (3-6 months) which are focused to analyse and demonstrate the feasibility of developing new products or businesses related to the Digital Design for AM challenge in a decentralised and distributed digital environment. Best Practice Experiments (10k – 40k): Widespread application experiments (4-12 months) which are conceived for benchmarking, testing, validation and improvement of new AM products, services and standards. You can also pitch your idea (or another idea) on 26th September at the Fieldlab MM3D network meeting. The meeting starts at 15.35 PM and is part of the Kunstsoffenbeurs 2018. If you have or one of your relations has an idea, please let send us an email to Henk.Buining@tno.nl. Posted on 20 August 2018 at 14:38. 3D-printen lijkt de toekomst te hebben, maar veel bedrijven aarzelen nog om er daadwerkelijk mee aan de slag te gaan. De Technische Universiteit Eindhoven (TU/e) en TNO hebben daarom de handen ineengeslagen en doen in het AMSYSTEMS Center onderzoek naar de industrialisatie van 3D-printen. PwC’s Wolter Kersbergen in gesprek met Katja Pahnke (TU/e) en Pieter Debrauwer (TNO). Read more. Posted on 15 August 2018 at 17:07. This Summer Fieldlab Multi-Material 3D partners NextDent, Océ- a Canon Company, Brightlands Materials Center and AMSYSTEMS Center have developed a 3D printer, the Multi Material 3D Test Printer (MM3DTP). The resins for this process are developed by NextDent, a 3D Systems company, and Brightlands Materials Center. The controlling of the MM3DTP printer is done by Van Mierlo Ingenieursbureau. With this printer the partners aim to develop an integrated 3D Workflow and print strategy to create full colour products . To show the abilities of this 3D printer Océ has printed the first samples this set-up (see the pictures below). The next step is to combine Océ’s inkjet technology with the Lepus Next Gen Printer of AMSYSTEMS Center. This integration is required to show the feasibility of printing full colour dental elements. The resins for this process are developed by NextDent, a 3D Systems company, and Brightlands Materials Center. The partners strive to achieve this by next year, July 2019. Due to the good results the partners are looking forward to the follow up. Posted on 9 August 2018 at 15:40. Recently, Pieter Debrauwer has been appointed as Managing Director of AMSYSTEMS Center, the joint R&D initiative of the Eindhoven University of Technology (TU/e) and TNO developing next-generation additive manufacturing systems together with Dutch and international industry partners. He holds his position in AMSYSTEMS Center together with the center’s co-director Katja Pahnke, appointed as Managing Director on behalf of TU/e and one of the founders of AMSYSTEMS Center. Simultaneously he has accepted the position of Research Manager of TNO’s department ‘Equipment for Additive Manufacturing’. Pieter is well-prepared and well-informed as he was already involved in AMSYSTEMS Center for several years as manager of one of the center’s program lines. In both positions, Pieter takes over from Erwin Meinders. Erwin has managed TNO’s department ‘Equipment for Additive Manufacturing’ for the past seven years and he has co-founded AMSYSTEMS Center. Erwin’s new position is CEO of Mentech Innovation (see www.mentechinnovation.eu), a company developing sensor-based technologies that enhance quality of life for people with a severe mental disability by detecting e.g. emotions and pain. Additionally he will continue his role as chief innovation officer at Severinus, a care organization. The steering committee of AMSYSTEMS Center wants to express its sincere thanks to Erwin for his entrepreneurial leadership in the past years and the committee want to wish both Pieter and Erwin much success in their new positions. The steering committee would like to express its trust in a good continuation of its valuable relationship and wish you a successful cooperation with the AMSYSTEMS Center in the future. In case of questions don’t hesitate to contact Katja Pahnke or Pieter Debrauwer directly. Posted on 31 July 2018 at 10:51. In 2017 Brainport Industries – together with TU/e and supported by Brainport Development – entered into a partnership with the Bavarian cluster for Mechatronik & Automation in Bavaria in the Additive4Industry project. Posted on 21 June 2018 at 09:36. Personalised food, vegetable proteins with the bite of meat or production on demand; digitally controlled food production enables innovations which were inconceivable until very recently. From 29 June, businesses can address all their questions about digital technology to the Digital Food Processing Initiative (DFPI), a cooperative venture between Wageningen University & Research, TNO, AMSYSTEMS Center and Eindhoven University of Technology. DFPI focuses on five innovation themes: sustainability, personalised food, on-demand food production, new forms and flavours, and new social experiences. While the main food applications to date have been related to 3D printing – such as new shapes of pasta – both organisations expect digital techniques to have a much larger social impact. On-demand production, for example, could lead to less food waste, while personalised food can help produce special high-protein products for the elderly or athletes. 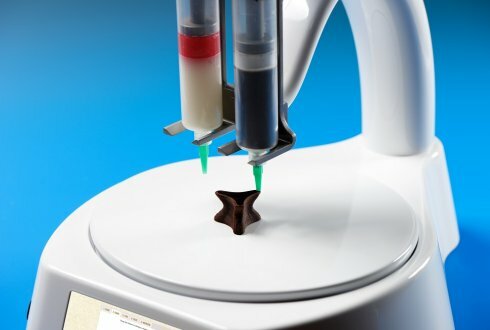 3D printing can change the functionality of food via the development of new structures, textures and flavours, which could have potential for people who have difficulty swallowing. Digital techniques are expected to drastically change the production, location and logistics of food production. Food producers, ingredient suppliers, machinery manufacturers, caterers, retailers and other interested parties can have a first look on 29 June at the options for digital food processing. The introduction will include various demonstrations of 3D food printing and presentations on the successful application of digital techniques in the food industry. Professor Arthur Mol, Rector Magnificus and vice-president of the WUR Executive Board, will officially launch the DFPI at 11.30. Learn more about the programme and register at the event page for the 3D Food Printing Experience. DFPI is a joint initiative of Wageningen Food & Biobased Research, the Wageningen chair groups Food Process Engineering and Physics and Physical Chemistry of Foods, and AMSYSTEMS Center, a partnership between TNO Equipment for Additive Manufacturing and TU Eindhoven High Tech Systems Center.